There is no state that celebrates the metaphorical season opener of spring – you know, that first day where it’s perfect outside, the sun is shining, and it’s time to find your shorts – like Minnesota. Spring to me has always meant the D.C. Cherry Blossom Festival, wonderful in its own right, but after I moved to Minnesota for college I experienced a true spring awakening: the true appreciation for spring one gets after surviving three, four months of bitter cold and snow, followed by rainy mud. We probably have the whitest legs of any state, and I never thought I’d see people wearing shorts at 45 degrees, but to some of us in Minnesota, 45 degrees is a whole 55 degrees warmer than January temperatures, so we’ll take it, thank you very much. The strange temperatures this year meant that even Minnesota barely had a winter. We emerged from the worst of it unscathed, only a few paltry piles of snow to show for it. Normally spring creeps up slowly, achingly, for most of March, April, and sometimes May, with ceaseless rains and dirty puddles. This past week, however, has been beautiful – dry ground, birds, weather in the 60′s, all of it. It’s a true miracle. Driving past the lakes of Minneapolis, I was amazed at the sheer amount of people outside, but knew that they were celebrating with me as well. If there’s one thing you can always talk about here, my housemate likes to say, it’s the weather. But this week no one even had to talk – everyone just smiled. I decided to celebrate the best way I know how – ice cream. March seems early but sitting outside, the temperature warm enough to melt some ice cream down my fingers, it didn’t feel early at all. 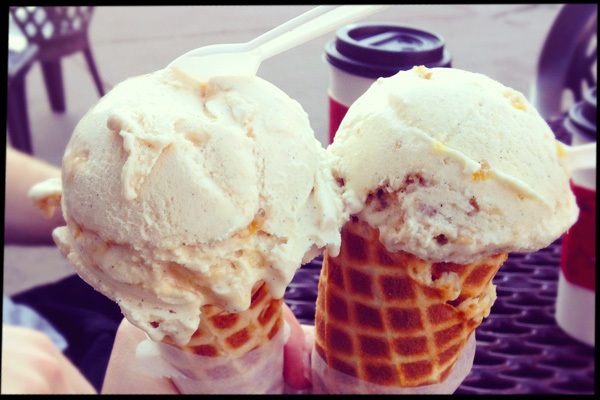 There is nothing better than enjoying the first cone of the season, especially at Sebastian Joe’s, a Minneapolis staple. They have delicious coffee roasted in-house and a stunning array of flavors that change daily. I was clearly in high spirits as I chose to order a scoop of what is called “Immaculate Confection”, a mix of ginger, lemon, and apple strudel pieces. Although I normally love luxurious flavors like chocolate, caramel, and peanut butter, I didn’t want something over the top. It’s easy to see how this flavor got its name: the ginger kick, the apple sweetness, and the bright citrus make it out-of-the-ordinary perfection. Immaculate Confection is the ideal combination for a sun-filled day. The most memorable apple pie Kenzie Zimmer ever had was a grilled one, thanks to the Great Maryland Power Outage of 2006.